Are you Ready to take on the job market? Whether you are looking to change from your current position or unemployed, it’s important to know the best way to present yourself in today’s job market. Keep reading for a few insider HR tips on how to successfully navigate the recruiting process and land the position you want. Once you have decided to go into job search mode, the first step is to update and shape up your resume. Create a resume that is brief and distinctive, focused on the future role you want and highlighting your accomplishments that support your ability to be successful in that future role. Use a clean-looking format that is easy to scan through and see what matters most. Use bullet points rather than long sentences or paragraphs. Stay with a generally accepted format that recruiters are accustomed to seeing with your work experience listed chronologically. Show only your best, most relevant accomplishments, skills and experience on your resume. Don’t try and cram every past undertaking & responsibility onto the page. When it comes to crafting your resume, remember you want it to be B.A.D. ; Brief and Distinctive. Keep in mind there are two kinds of recruiters that will be looking at your resume; external recruiters that work outside of the business, such as a staffing firm, and internal recruiters (HR) that work inside the business. There are slight but key differences in what internal vs. external recruiters may look for in a resume. The internal recruiter may have a better understanding of the needs of the position, how it fits in the organization, budget and other dynamics such management style and desired personality fit. The external recruiter probably has less information to go by when assessing your resume for “fit or no fit”. Both types of recruiters are looking for the resume that best matches the requirements they’ve been given by the company or hiring manager. The external recruiter wants to find a resume that matches, so they can present it and get paid when the company hires you. The internal recruiter (HR) wants to find a resume that matches so they can fill a position with someone who brings value to the organization. A key difference is the internal recruiter has to “live with” the person that gets hired and is more accountable for a new hire’s success or failure. 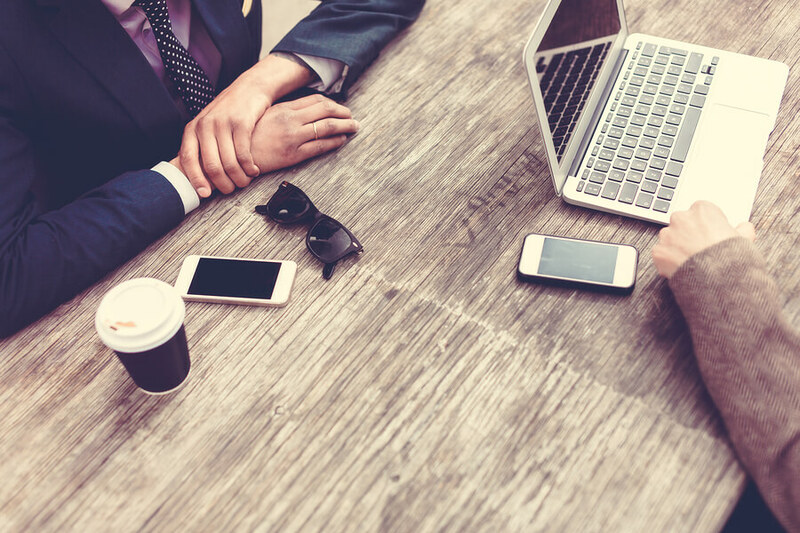 Understanding these differences and what type of recruiter you are dealing with should guide how you manage the recruiter/candidate relationship. So, what do recruiters look for when scanning a resume for the first time? A recent research study indicated that on average recruiters spend about 6 seconds scanning a resume. Six seconds is the average, often it’s much shorter if something on the resume doesn’t pop to the recruiter’s eye right away. That means you have less than 6 seconds to grab the recruiter’s attention enough to make them keep reading. Previous Position Title and Company. Are their gaps in employment? Is this a contractor or a serial job hopper? The study which tracked eye movements of recruiters scanning resumes, showed that recruiters spent more time looking at resumes that have a clear and concise, easy-to-read format. This is where the importance of brief and distinctive comes in. You are more likely to compel the recruiter to keep reading with a B.A.D. resume. If they do keep reading, they’ll be looking for evidence in your resume that you are good match to the position they are working to fill. However, they won’t spend too much more time, typically another 15 to 20 seconds. So, you still have to keep it brief and only put examples of your best self on your resume. At this point, there are a multitude of variables that impact the recruiter’s decision to put your resume in the keep or toss pile. It’s impossible to nail down an exact list of what they are looking for in this next 15 to 20 seconds of review; except to say they are looking for the best match for the position they are working to fill. 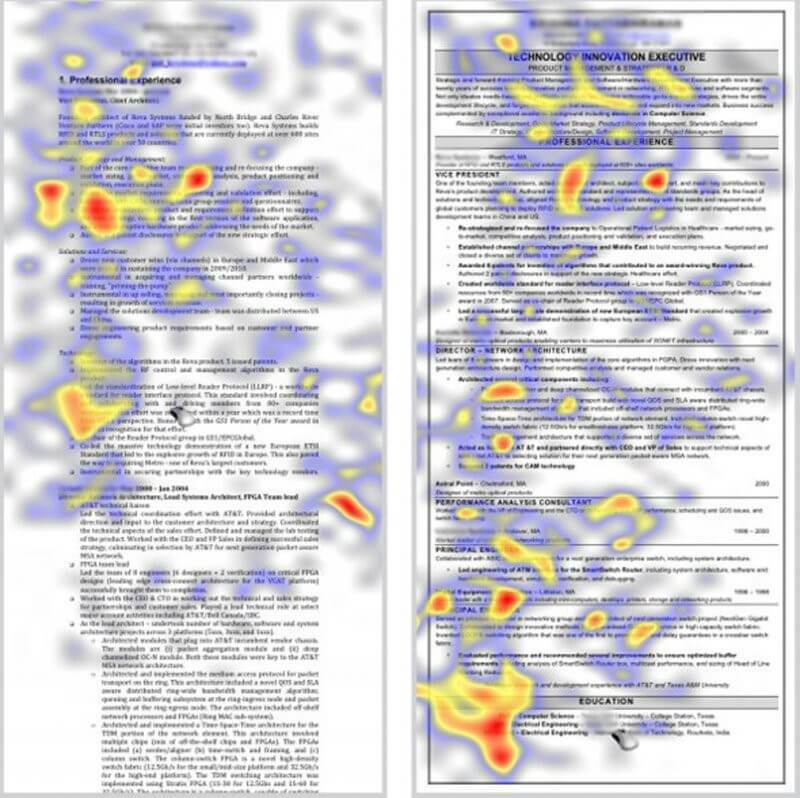 Researched heat samples of a recruiters eye when reading two different resumes. The recruiter spend more time with the resume on the right because it has a cleaner format, a nice career summary, a good mix of keywords and is not overwhelming with content. What to summarize in your resume ? End result of all the recruiter’s reviews is that they end up with a short stack of resume for potential interview. Now everybody understands that the hiring is for a person, not a piece of paper. There is really no way to tell if that person is truly a fit for the role and the company unless you talk to them. Your resume is your tool to open doors to actual conversations. Think of it as your brochure. You want the best, eye catching information up front. Then you want them to quickly discern that your relevant skills & experience, competencies and accomplishments fit their needs. The ability to lead groups of people. The ability to show results. The ability to continually learn and develop skills. Showcase the benefits you can bring to the organization. 3-6 bullet points describing each job that you held. Don’t go back more than 10 years in time. Progressive responsibilities within leadership positions. Very focused on implementation of programs, results, and initiatives. Action verbs such as lead, initiated, developed, created. 10-15 bullet points describing the last 2-3 jobs that you held. Don’t go back more than 15 years in time unless the job posting requests more information. Don’t be pushy or overeager. Follow up with thank you letters. Why are you interested in this position? Link your skills to the position. Highlight your strengths, applicable skill set, and passion for the company and position. Tell me about yourself? Don’t use the typical chronological progression. Use the SWOT method (Strengths, Weaknesses, Opportunities, and Threats). Also do not spend too much time droning on. Pick 2-3 experiences that are specifically related to the job you are applying to. Don’t take longer than 5 minutes per experience. Why are you leaving your current job? HR is looking to see if there are any red flags. Talk positively about your current/former employer but express your desire to progress yourself further in your career. Positivity is the key. What do you know about the company? Research a company through their website and press releases, but make sure you can provide a little more than what can be found in a basic search. Dig a little deeper to show that you are interested in the company and have done your research. What questions do you have for me? Always have questions and make sure they are more than just what can be discovered through the company website or job description. Ask questions related to the company culture, career paths, and why is the position open. What if you have gaps in your employment? Career gaps and frequent job changes imply a sort of career stagnation, instead of career progression which hiring managers like to see in a resume. It might be seen as lacking ambition, abilities or even integrity. So make sure you address this issue on the resume and not wait until you get an interview. Be honest: sugar-coating your answers will not help. Hiring managers usually see through them. Keep it positive when talking about why you left your job before the gap. Emphasize any activities you undertook during the gap to improve your professional standing. If you have too many brief stints, list the reasons for those short job stints right next to the dates on your resume to avoid this obvious red flag. It’s preferable to use a functional resume in this case. If the company asks for a number on the application try to leave it blank or state “will discuss”. I’m much more interested in the type of work than I am in the size of the initial offer. I am open to a competitive salary and benefits package. What is the pay range of the position? If the company still requests a number give them a rate that is more than the minimum you would accept. You Have The Offer. Now What? Even if the offer is below your expectations be gracious and express excitement before discussing details. Ask for some time to think through the offer and ask them when they would like a response back. Once you’ve thought through the offer respond quickly. Email is a great way to collect your thoughts, craft ideal responses, and put your best foot forward. Be prepared to explain what you want, why you want it, and if possible how it will benefit the company. Provide the research that you used to come to your determination. Whatever you decide be gracious in your response. Don’t burn bridges.